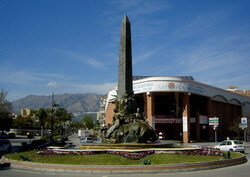 Fuengirola - a multi-cultural seaside resort on the Costa del Sol. Previously a small fishing village, it has undergone a huge amount of change over the last few years. However, it is still possible to see the older buildings and narrow streets, as well as the newer developments, wonderful fashion and shoe shops, modern supermarkets, restaurants, bars, etc. New shopping complexes are opening up both in Fuengirola and on the border of Fuengirola and Mijas. Fuengirola's Feria and Fiesta del Rosario is held from the 6th to the 12th October each year and features displays by horses as well as bullfights, flamenco dancing and other popular Spanish cultural activities. At the beginning of the celebrations, preparations began in the Plaza de la Constitucion - silken flags were strewn across the plaza, and the church is decorated with hundreds of wonderful flowers. Just prior to the annual feria is an event called "la Romería" in honour of the Virgen del Rosario. A fascinating procession passes through the streets with beautiful ox drawn carts. Fuengirola is probably the most multi-cultural city in all of Spain with almost the whole world represented in its residents. Feria Internacional de los Pueblos - the annual International Feria is held in April of each year. For 4 days the fairgrounds are packed with people and there is much eating, dancing and entertainment from the four corners of the world. You can buy gifts and momentoes from many of the countries represented, plus delicious food, and enjoy a fascinating parade in the streets of the various country people in their national dress. View photo gallery. In February, the Fuengirola Carnival is a fun event with great entertainment for the children, who all dress up in lovely costumes. The celebration of Virgen del Carmen - both the patron saint of fishermen, and also a special Fiesta on the southern coast of Spain. On the evening of July 16, in the fishing villages and towns up and down the Coast, the much-loved effigy of Virgen del Carmen is not only paraded through the streets but also taken for a spin round the bay on a flower-adorned boat, accompanied by a flotilla of "jábegas" (fishing boats) - which are blessed for the coming year in the process. Brass bands play, crowds clap, rockets shoot off and fireworks fill the late dusk sky. Semana Santa or Holy Week, at Easter time is a fascinating event with solemn parades, with fascinating costumes through the streets of Fuengirola.